It all started out with a saddle of lamb. It was what Onno von der Emde had on his plate at a business meal in Philadelphia and it gave him the idea of raising sheep. He wanted to produce his own meat – simply because it tastes better and because Onno wanted to be certain what was on his plate and how it got there. Sounds reasonable enough. In fact, almost too reasonable at first, and not entirely compatible with the romantic ideal that shepherds are usually associated with – of adorable lambs and contemplative walks through untouched nature. It quickly becomes clear there’s nothing romantic about it. Onno’s flock consists of around 25 ewes, which will give birth to as many lambs in February. In the following months, the hobby shepherd leads his animals from meadow to meadow, where they graze, until the lambs’ life ends in July or August. “It’s a natural cycle,” says Onno, whose animals are livestock, after all. When we and our camera accompany him as he drives his herd to a new pasture, it is conspicuous how much the animals keep to themselves. This isn’t a petting zoo. The animals gallop ahead to reach their new feeding ground and hardly show any interest in us humans. “They only find me attractive because I have their food,” explains Onno.He runs ahead, focused on the task, a can of feed in his hand. The only thing he seems worried about that day is the crossing of the multilane B39 highway, which leads past the SAP campus in Walldorf. 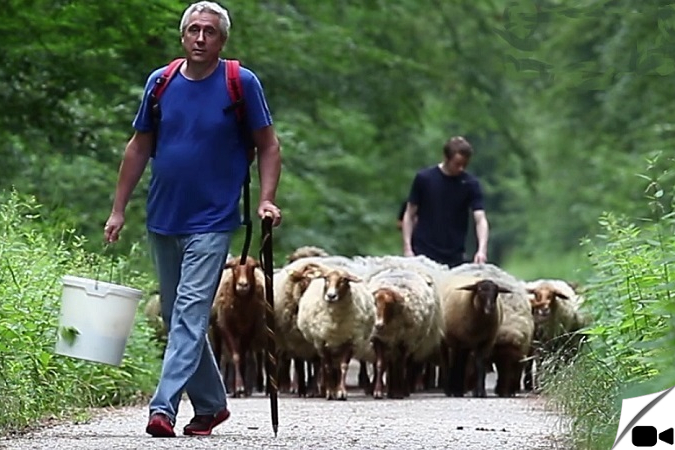 With the nearly 50 sheep following him, it is no small endeavor. But Onno gives an impression of unflappability. That’s a good thing, too, because his job at SAP demands that he solve critical issues for his customers. As Vice President in the Digital Business Services board area, he heads an international team of some 60 employees spread between Beijing, Newtown Square, and Rot and Walldorf. Whenever he returns from one of his many business trips, his flock of sheep serves as his balance and counterpole. But tending them alone wouldn’t be fulfilling enough in the long term, says Onno. It seems another part of him seeks challenges and the action that his job at SAP provides in abundance. What motivates him to practise this unusual hobby? “My time with the animals is really a lot of fun,” says Onno. At the same time, he and his flock also contribute toward nature conservation and landscape preservation. On behalf of the surrounding cities and municipalities, he and his sheep cultivate fallow vineyards, meadow orchards, and forested areas that no machines can reach. As such, the sheep prevent these areas from shrub encroachment, creating space for biodiversity. What’s more, admits Onno with a grin, his hobby lets him fulfill his childhood dreams of working with large farm machines, making hay, and driving a front loader. In contrast, he is critical of industrial farming. “Traditional animal husbandry is dying because it just isn’t worth it for the farmers any more. A liter of milk sometimes costs less than a liter of mineral water in Germany,” complains Onno. You hardly ever see animals out in the pastures any more, he says. Instead, they are held in huge facilities, in the hundreds or even thousands, that are more like factories – industrial meat factories. No, there’s nothing romantic about this. But it’s rather about having a conscious and responsible approach to nature, to animals, and Onno’s hope that “we can preserve this way of life for our children”.